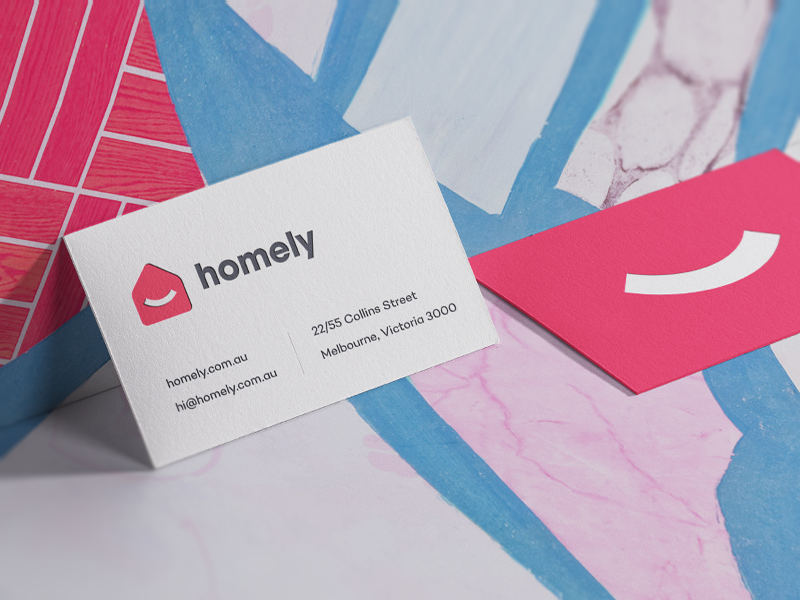 Eddie Lobanovskiy designed these business cards for Homely, an internationally acclaimed real estate portal founded by Jason and Adam Spencer in Melbourne, Australia. Homely provides easy way to find real estate and property for sale and rent in Australia. What’s catchy about its visual identity is the big smile on the card. Thanks to a bright coloured (red) background, it’s pretty hard to miss! “The design process starts at the moodboard with ideas and inspiration from all over the web. Once we find out what vibes we like from the moodboard, we begin to play with concepts/layouts/colors etc. Some explorations are serious, some are playful, and others are fun. It really depends on how the brand wants to present itself. Many revisions later… Boom! We all agree (including the client) on something that works for the brand,” Eddie said. The use of lowercase text for the brand name makes it appear more approachable, friendly and casual. The simple yet attractive logo (smiley house icon) plus the bright colour scheme are all exuding an optimistic vibe about being ‘homely’ and finding that happy place we call ‘home’. These catchy minimalist business cards were printed by Moo.